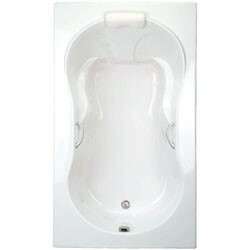 The Hampton R is a unique rectangular tub with a deep bathing well and integral armrests. Includes one pillow and two decorative handles. Available as a soaking tub, air tub or whirlpool tub. Call 800-720-1062 for more details. 42" x 72" x 23.5"
Dimensions: 72"x 42" x 23.5"
Hydro-V jet system targets the back with strategically placed jets: Eight jets massage the shoulder blades, upper and middle back muscles and the bottom two spinning jets massage the lower back. Optional cable operated drain in color-match, crome, everbrass (PVD), brushed nickel or oil rubbed bronze.